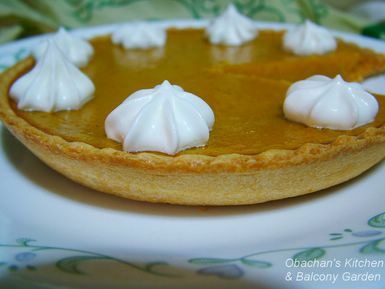 Obachan's Kitchen & Balcony Garden: Happy Thanksgiving! your pie looks great, did you make the crust too? I'm dying from curiosity. Please give us some small hint of your background. I'm pretty sure you're Japanese/Japanese, but I get a very USA vibe from your writing. Especially Thanksgiving?! Did your family live in the states? Were you an exchange student or college student? PLEASE, PLEASE, PLEASE! Just a little scrap of info. That's a pre-made crust, isn't it? Those are perfectly fluted edges. Beautiful pie!! Your creations are all so good to look at. It's a good looking pie. Looks sweet too. hey obachan!!! :) how are you? I just noticed that you have my old, soon-to-be deleted blog url in your sidebar. Hope you had a happy thanksgiving weekend. Happy Thanksgiving. Did you eat turkey? Yep! It’s a pre-made one. All I did was making the filling out of kabocha (imported from NZ) and whipping the cream. It didn’t take long. Yeah, it was sweet, but not too sweet. Hi! So nice to hear from you. Sorry I haven’t been to your site for a long time. Happy Thanksgiving! 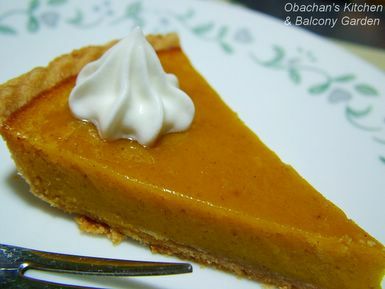 Wow, that looks like a really great pumpkin pie! Ship it to my house! Hi! I saw your thanksgiving posts and my room was flooded with my drool! :D I wish I were there to enjoy the great feast.